ARGAN OIL is produced from the kernels of the endemic argan tree and is valued for its nutritive, cosmetics and medicinal applications. The tree, a relict species from the tertiary age, is extremely well adapted to the extreme environmental conditions of the southwestern Morocco. 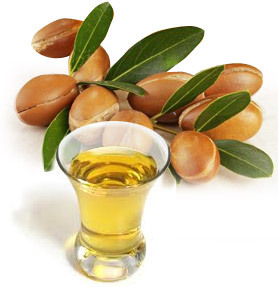 ARGAN OIL remains one of the rarest oil in the world due to the small and very specific growing area. Argan oil is exceptionnally rich in natural tocopherols (vitamin E), rich in phenols and phenolic acid, carotene, squalane, and essential fatty acids. It contains 80% unsaturated fatty acids and is, depending on the extraction method, more stable than olive oil.